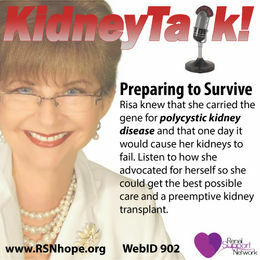 Here’s a really goo d podcast from the Renal Support Network on “Preparing to Survive” from Polycystic Kidney Disease and knowing you have a ticking time bomb in your genes and that one day your kidneys will fail. To listen CLICK HERE. This entry was posted in dialysis, ESRD, kidney, patient care, polycystic Kidney Disease and tagged dialysis, ESRD, hemodialysis, kidney, patient, PKD, Polycystic Kidney Disease. Bookmark the permalink.